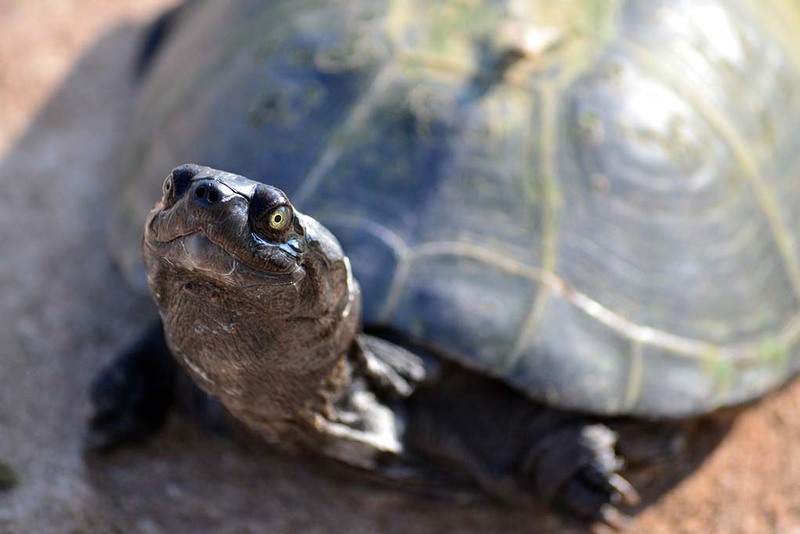 Did you know that the turtles in the “moat” in front of the Phoenix Zoo undergo routine management efforts to help protect native turtles and other species in the area? Every year, it is estimated that hundreds of unwanted pet turtles are released into this Papago Park pond and other community lakes by their owners. The first non-native species turtle trapping was held at the Phoenix Zoo in 1999. Since then, more than 880 individual turtles, representing 19 species, have been captured and nearly 560 have been removed. All female non-native turtles will be removed from the pond and placed with the Phoenix Herpetological Society to reduce population growth and keep from overcrowding. This will help prevent non-native species from traveling to nearby waters where they could out-compete, spread disease to or prey on native turtles and other native aquatic wildlife. Non-native male and all other native turtle species found at the pond will be returned to the water to continue to provide zoo visitors the unique opportunity to view them from the bridge upon arrival. Turtles will be trapped and measured, weighed, sexed, species verified and marked for identification. The event is held in conjunction with World Turtle Day on May 23, and is also used as a teaching experience for the Game and Fish Department’s homeschool program. World Turtle Day aims to promote turtle conservation efforts. Traps will be set at 8 a.m., and checked at noon and 4 p.m. on Friday. Traps will be rechecked at 8 a.m., noon and 4 p.m. on Saturday and Sunday. Trap checking takes approximately two hours. – Linda Hardwick of the Phoenix Zoo at (602) 663-3254. In 2016, 31 turtles were caught during the trapping; 27 of those were red-eared sliders (pond sliders), a common household pet. Many of the smaller turtles had evidence of previous captivity, indicating they were most-likely intentionally released by their owners. Turtles will be live-trapped using fish as bait. This is a good opportunity for families to watch wildlife management in action, and learn about responsible turtle and small-pet ownership.